» Archived Review: ROY HUGGINS – Too Late for Tears. Archived Review: ROY HUGGINS – Too Late for Tears. ROY HUGGINS – Too Late for Tears. Pocket 602, 1st paperback printing, 1949. 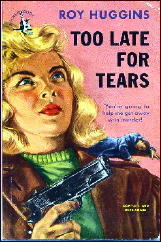 Hardcover: William Morrow, July 1947. Hardcover reprint: Detective Book Club, Oct 1947. Previously serialized in The Saturday Evening Post, April-May 1947. Movie version: United Artists, 1949; Roy Huggins, screenplay; with Lizabeth Scott, Dan Duryea, Don DeFore, Arthur Kennedy, Kristine Miller. It was like almost any southern California night, a frostbitten moon high and withdrawn among a few reluctant stars, a cool salt breeze blowing in from the sea and sweetening through the odor of brush fires in the hills. The open convertible rolled to a slow stop and the man stepped out and closed the door. The woman sat, not moving, staring out across the endless horizontal monotony of the Valley. He leaned over and asked if she had gone to sleep, the tone carrying the suggestion of banter, timidly, as if he were uncertain of its reception. They are married, Alan and Jane Palmer, and they are soon quarreling, before fate steps in their way. Barreling down the hills with the headlights accidentally turned off, a car going the other way tosses a small bag into their car, changing both of their lives forever. It’s full of money. Jane thinks they should keep it. Alan, who works for a bank, is much more cautious, but he is convinced by Jane to wait a week and see if anything appears in the newspapers about stolen money. Once he has checked the bag in a locker at the train station, however, events have been put into place that can not be reversed. She raised her shoulders and put her lips against his. They were hot and his breath was hot and she was lifted and caught up tightly. And there was something both understood in the same swift flight; that this was new, that there was something now they hadn’t had before, deeper, richer, drawing them close. And only Jane knew that it was compounded of need and isolation and fear. 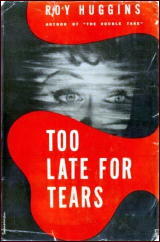 From Chandler, then, to a slick combination of Cornell Woolrich and James M. Cain, with some variations on the theme by Roy Huggins himself. Other characters have roles to play. Alan’s sister Kathy has an apartment a few doors down; Danny Fuller, the small time hood for whom the money was intended, naturally makes a quick appearance; and the mysterious Don Blake, who claims to have been a wartime buddy of Alan, makes an uneasy alliance with Kathy. It doesn’t work completely, but hitting on 15 of 16 cylinders at high speed is a pretty good percentage. If there is such a thing as noir fiction, this is it, and it’s top notch. PostScript: The reason for the last statement, and I could be wrong, is that I take noir to be a film term, not a book-related one. I wish I could remember seeing the movie, but I can’t. If it follows the story-line of the book at all, and with the cast it has, I know it would be tough to forget if I had. [UPDATE] 03-02-13. Well, I hadn’t seen the movie when I wrote this review, but I have since, and I’ve even posted my comments here on this blog, way back in 2009. I liked the movie as much as I did the book, as you can go read for yourself. I often read the book and then view the film adaptation. I remember doing it with TOO LATE FOR TEARS a few years ago and being impressed with both the novel and the movie. I found the influence of Chandler to be quite strong, at least as strong as in the novels of Howard Browne. 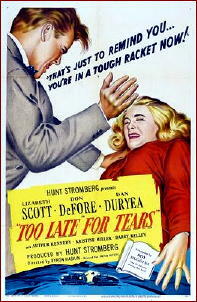 In the movie Lizabeth Scott gives what may be her best film performance. I just ran this picture and found it wanting in credibility. Did not believe the initial situation or the subsequent events re Jane’s prior life. The cast does what it can which is plenty. Speaks to my deep seated belief that the actor is almost all in films and especially these compact noirs. They were all fine and I had no trouble with Don DeFore, who by the way, was outstanding in the western noir Ramrod. The are some photographs posted of Lizabeth Scott from around 2010. A very old lady and looks it but is still deeply attractive. I don’t remember the details of either the book or movie, but the initial premise, that of a couple having a satchel of money tossed into their car, may be unlikely but possible. I’m going to have to think about it some, but right now I suspect that a lot of noir books and films are based on start-up situations as shaky and improbable as this. It’s where the author or movie-maker takes us from there that’s the key, and that’s where the characters and the cast come in. Food for thought, I think. Completely contrived without the literary finesse required. The kind of thing called a pot boiler or page turner. Okay, until you think about it twice.